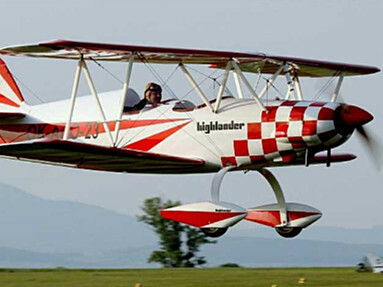 Skylane is classic design, two seat, shoulder-wing monoplane. 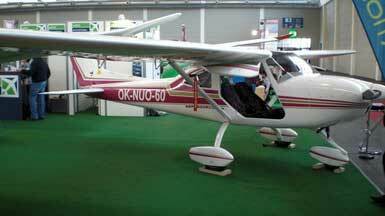 At first sight it reminds of large sport plane, although it is an ultralight. This plane is deservedly by its favourers denoted as a small Cessna. Not only by its look, but with its characteristics, this plane far overtops all planes in its category. 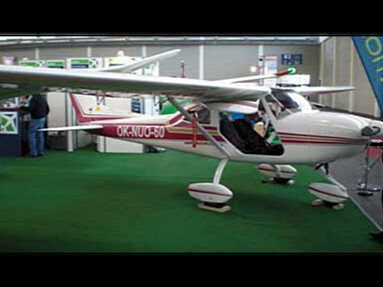 Very easy controllability and hereat high reliability, predesignates this plane for holiday flying and also for aviation tourism. This plane can be used for towing of sail planes too. The wing is strut-braced, wooden design, it has semi-laminar profile MS (1)-313. The centre section of the wing is rectangular, outer parts are trapezoidal, with short winglets on the wingtips. Main spar, situated in 37% wing's depth is made of wood. In front of main spar, in rectangular part, is torsion box, with integral fuel tanks (2x35 litres). Trapezoidal part of torsion box is coated by plywood. Behind the main spar, wing consists of wooden ribs and short auxiliary spar. The ribs are coated by aviation fabric. Landing flaps are single-slotted, in 29% of depth. They have fixed positions at 13°, 29°and 37°. They are operated by electric servo. Flaps structure is made of wood and consist of spar, ribs, plywood and fabric coating. The ailerons are all-wood, with one spar, ribs, plywood and fabric coating. Ailerons are operated by rods and their deflections are diferential. Tail assembly structure is all-wood, classical design with elevator and rudder. The profile of fin and tailplane is symetric, NACA 0012. Design of tailplane assembly is the same as design of landing flaps. The fin is integrated part of fuselage. The undercarriage is fixed, three wheel type. Main landing gear is laminated spring. Wheels are fitted by independent hydraulic brakes, controlled by pedal brake valves on rudder steering. Towed type nose gear is spring loaded by steel spring with hydraulic absorber. It is not steered, it is freely slewing round about 360°. As a powerplant can be used whichever engine with power of 50-100 HP (e.g. Rotax by customer´s option) and propeller with fixed blade, adjustable blade or variable pitch blade with diameter of 1700 mm. Weight of powerplant assembly:50-80 kg. Air controlls are coupled, steering wheel type. Ailerons and elevator are controlled by rods and levers, the rudder is controled by steel cables. The airplane is standardly equipped by instruments for flight and engine monitoring . By customer´s option is possible to install another instruments, including GPS. Colour scheme and bolstering is performed by customer´s option. Next, the plane can be fitted with rocket escape system, flash lights, beacons, position lights, etc.